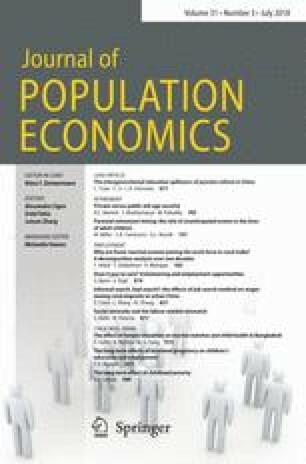 This paper uses variation among siblings to identify the consequences of childhood poverty on both labour and marriage market outcomes. In the labour market, individuals who experienced childhood poverty are found to have lower earnings and lower labour market attachment and to have worse jobs both vertically in terms of low-paying industries and horizontally in terms of job positions. In the marriage market, childhood poverty is found to have negative consequences for the probability of marriage, cohabitation, and having children around the age of 30. The effect sizes are found to exhibit an inverse u-shape in the age of the child, peaking during adolescence. Results on educational choices suggest that the mechanisms behind these results can be that childhood poverty affects the skill formation, networks, and decision making of the child. The author would like to thank the anonymous referees for helpful comments and suggestions. I express my thanks for useful comments on this paper and earlier drafts to Erdal Tekin, Rune Vejlin, participants in the European Economic Association Annual Congress 2015, and participants in the 8th Nordic Econometric Meeting. The usual disclaimer applies.